Murray J. Harris is professor emeritus of New Testament exegesis and theology at Trinity Evangelical Divinity School and formerly served as warden of Tyndale House at Cambridge University in England. Harris has a Ph.D. from the University of Manchester, where he studied under F. F. Bruce, and is the author of numerous books, including, Jesus as God: The New Testament Use of Theos in Reference to Jesus, Slave of Christ: A New Testament Metaphor for Total Devotion to Christ, The Second Epistle to the Corinthians from the acclaimed New International Greek Testament Commentary series (NIGTC), Colossians and Philemon in the growing Exegetical Guide to the Greek New Testament series (EGGNT), and many more. 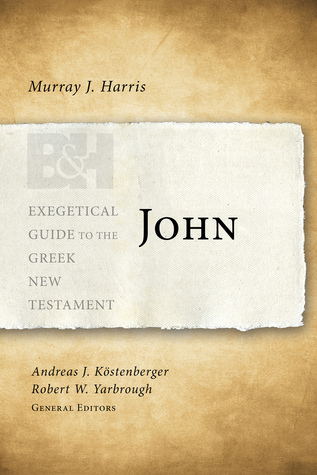 Most recently, Harris has released his second contributing volume to the EGGNT series, a volume on the Fourth Gospel that certain to make its residence on the bookshelves of many. The Exegetical Guide to the Greek New Testament series was birthed out of a desire to function as a type of middle-ground resource that seeks to narrow the gap between the text of the Greek New Testament (UBS5) and the available lexical and grammatical tool being used by pastors and teachers today. In this present volume, Harris has delivered a goldmine of exegetical wisdom and theological insight into one of the most important New Testament books. The book begins with a very brief introduction focused on authorship, purpose, audience, setting, and date, as well as an extremely helpful and necessary section of John’s style of Greek and the overall structure of the book. The introduction concludes with a short discussion surrounding the pros and cons of five recommended commentaries and additional resources. This section is useful for the detailed reader as these resources become imperative in further investigating the exegesis that follows. However, if you are looking for an up-to-date bibliography on the Fourth Gospel this is not going to be a helpful section. Still, the abbreviations section just prior to the introduction does provide a wealth of resources mentioned throughout the book that may be of use. As the reader enters into the commentary of the gospel, Harris has skillfully utilized a similar format and layout as the other volumes in the EGGNT series. Some accommodations have been made given the nature of the gospels themselves, as opposed to that of epistles. For example, the reader is not going to find as much sentence diagraming in this volume as the others, and the layout centers primarily around the verse level as opposed to the clause level in the other volumes. Personally, I found this to be somewhat of a disappointment because of the helpfulness of the clause level interaction for the task of exegesis. But, then again, this is primarily helpful because the other volumes are structured around the epistolary genre and not gospel narrative. Nevertheless, I think the reader will find that the verse-by-verse discussion is executed extremely well, and Harris, as anticipated, is successful in guiding the reader through the gospel of John with a fine tooth comb. Finally, after each section of the text is thoroughly examined, Harris has provided the reader with a “For Further Study” section, as well as “Homiletical Suggestions” that aid the pastor or teacher in constructing a communicational roadmap based on the previous sections. As each volume of the EGGNT series is released the bar of exegetical example is visibly raised. Murray J. Harris has demonstrated what it looks like to provide faithful text-centered exegesis, and to do so with communication to the people of God as the primary goal. Harris has provided the reader with a detailed analysis of the lexical and grammatical style and structure of the Fourth Gospel, and he has done so in a clear and understandable way. Not only is this the best volume in the EGGNT series, but this is likely the best resource available on the market for those looking to walk through the Greek text of the Fourth Gospel. If you are a pastor, teacher, or learned laymen this resource will prove itself invaluable to your library. If you are a professor and looking for a faithful guide to send home with your students, who else would you rather have by their side than Murray J. Harris? For these reasons and many, I couldn’t recommend this resource more! I received an advance review copy of this book in exchange for and honest review. I was not required to write a positive review. The opinions I have expressed are my own. I am disclosing this in accordance with the Federal Trade Commission’s 16 CFR, Part 255: “Guides Concerning the Use of Endorsements and Testimonials in Advertising.